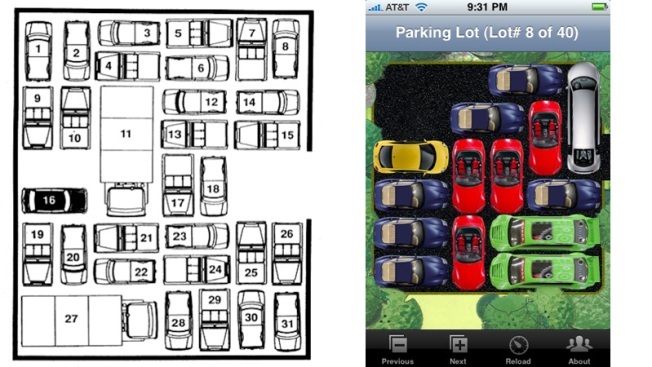 Don Rubin's "Lots of Luck" on the left, iPhone App "ParkingLot" on the right. Copyright infringement? You be the judge. Don Rubin's brain twisters were once so popular the Postal Service gave him a zip code to handle all the mail they generated. And one game in particular, called Lots of Luck, has proven so timeless it's even been made into an iPhone app. Problem is, nobody asked Rubin if they could "borrow" his idea for a tricky test where the idea is to get a car out of a crowded lot in as few moves as possible. So Rubin has sued Apple, alleging that ParkingLot, a hot seller on Apple's App Store, infringes on his copyrights. Rubin is asking Apple to stop selling ParkingLot, delete any copies and pay damages and legal fees. iPhone apps and Facebook apps have generated lawsuits before, including Scrabulous, an online knockoff of Scrabble so famous people made videos about it. Hasbro and Mattel forced Scrabulous to change its name to Lexulous and alter its playing board so it no longer mimicked the traditional Scrabble board. Making software that is similar to an existing game isn't automatically a violation of copyright, according to Rich Stim, an expert who writes for legal publisher Nolo, but it's easy to run afoul of litigious gamemakers. Jackson West figures such is the karma of Apple's being so aggressively protective about copyrights.